Everton made eight changes from the side that slipped to defeat against Arsenal at the weekend and in my opinion it was two changes too many. With Jagielka injured and Barry suspended we were always going to see Funes Mori and Darron Gibson. Out wide it was important to bring Kevin Mirallas into the fold and Arouna Kone offered an alternative option up front and has been unlucky in recent weeks not to feature more, especially after his impressive cameo against West Brom. Joel Robles for Howard in goal, I think you would struggle to find an Evertonian who didn’t agree with that decision which leaves the introduction of Osman, Browning and Oviedo. You could argue a case for one of the three to bring some freshness into the fold and in my opinion bringing in Osman and giving Barkley a rest wasn’t a bad decision, although at times it did leave the midfield a little short of legs. Barkely has looked a little jaded since the international fixtures and a break from the starting line-up will do him good over the longer term. The two unnecessary defensive changes however, left Everton exposed at the back and a better team than Norwich would have made Everton pay. At times, especially in the first half, it looked like men against boys, with Everton all over the place. In the end the Blues were very thankful for an impressive performance for Joel to keep Norwich at bay. Last season was terrible, Europa League aside Everton failed to hit the heights of Martinez’s first year in charge and it left large sections of the Goodison crowd unsure as to whether Roberto was indeed the right man to lead Everton. A solid if unspectacular start to the season has started to repair the broken relationship between supporters and manager, however on Tuesday evening his decisions to rest several first team players raised tension levels and with Everton below par and a goal behind the substitution of Arouna Kone rather disappointingly drew boos from some sections of the Goodison crowd. As it turned out it proved a good decision, Osman the other option to be withdrawn, popped up with the equalising goal and the revised formation allowed Everton to take a stanglehold in the game. Traditionally Everton haven’t performed very well in penalty shoot-outs. There are many examples throughout the history of the club where the Blues have gone out of major cup competitions after losing their nerve from 12 yards, Borussia Moenchengladbach and Fiorentina the most high profile. However their are signs that Everton are becoming very good at penalty kicks, wins over Manchester United and Chelsea under David Moyes and more recently under Roberto Martinez, pre-season wins over Juventus and Stoke City. Yes we did lose to West Ham in the FA Cup last year, but by the time the decisive kick was missed by goalkeeper Joel Robles, Everton had scored 8 of their 9 spot kicks. 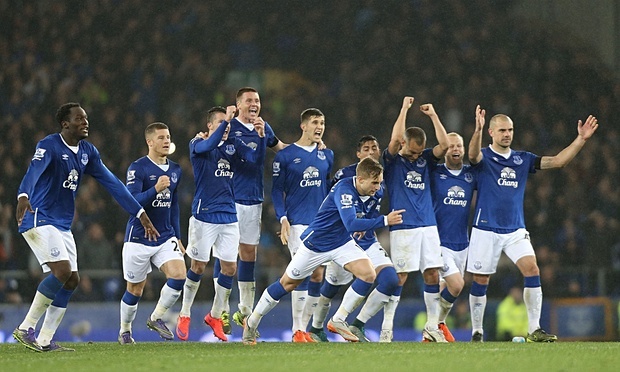 On Tuesday evening Everton’s spot kicks were pristine. Deulofeu, Barkley, Lukaku and Gibson all converted with ease to help the Blues into the quarter finals. Roberto Martinez has already stated that Tim Howard will return to the team for the Sunderland match on Sunday. I think his post match statement was important to stop the momentum building, especially if he has no intention of dropping the USA international. The decision to recall Tim Howard after a very impressive performance from Joel Robles has already drawn heavy criticism from supporters on social media. The Spanish keeper was excellent, making several brilliant saves to keep Norwich at bay. His two saves from Grabban were superb and demonstrated the huge potential possessed by the former Atletico Madrid keeper. In my opinion Joel is ready to take over as Everton’s number one keeper and unless Tim Howard drastically improves his performance levels over the rest of the season I am sure Roberto Martinez will demonstrate his ruthlessness (Distin last season) and remove the long serving keeper from the team, especially if Joel continues to perform at a high level when given the opportunity in cup fixtures. With Everton into the quarter finals of the league cup for only the second time in the last 27 years it is time to prioritise the competition with the aim of ending our 20 year trophy drought. With Chelsea, Arsenal and Spurs already out of the competition the draw has opened up and presents Roberto Martinez with an excellent opportunity to be the first Everton manager to lift the League Cup. If the Blues are to be successful we need to start playing our strongest side from the quarter finals onwards. Up until now we have come from behind in each round and scrambled our way past Barnsley, Reading and now Norwich City, with important players coming off the bench to recover lost situations. This type of good fortune will eventually run out and a strong starting eleven is essential to ensure Everton progress. Previous Post What did I witness? Apart from the casual racism…?